With the Canadian dollar currently worth just 69 US cents, now is a good time to take that vacation up north. One of my favorite Canadian cities is Victoria, B.C., which is just a one-hour float plane ride or a 3 hour high-speed passenger ferry ride from my home base of Seattle. And my favorite place to visit in Victoria is the Royal B. C. Museum, which is filled with world-class exhibitions and permanent galleries – and which has lots of treasures tucked away in the vaults. There’s an admission charge to enter the museum (well worth it), but there’s a new gallery – the Pocket Gallery – that is free for everyone and filled with objects from the collection that are rarely or never put on view. The first Pocket Gallery exhibition, Finding Fishes, features beautifully crafted replica fish and preserved fish collected from the BC coast and among the specimens on display is the Bony-eared Assfish, the first of its kind found anywhere in BC. I spent a few days poking around Denver while waiting for the new Westin to open out at the airport and, thanks to the enthusiastic folks at the Colorado Tourism Office, Visit Denver and a host of others, found plenty to keep me entertained and planning a return trip. Here’s a quick look at a few places I had a chance to visit. If you’ve got someone driving you into the city from the airport, plan your arrival to coincide with the Tasting Room public hours at Leopold Bros. distillery, on the way into town. On the menu: tasty, award-winning, small batch whiskies, gins, vodka, liqueurs and a few other spirits all made right there. In town, I stayed at the Crawford Hotel, located inside Denver’s historic, restored Union Station. The station’s Great Hall – which has more than a dozen restaurants, bars and boutique shops – serves as the hotel’s lobby and has become a living room-style gathering spot for locals. Upstairs, some of the 112 rooms are “Pullman-style,” in a nod to the heyday of train travel, with ‘classic” and roomy “loft’ rooms rounding out the other options. Guests who take the time to type a letter can have it mailed for free. While in town, I visited the bigger-than-I-imagined Denver Art Museum, spending most of my time with the Western American Art collection, and toured Hostel Fish, where they have a fresh, modern take on the classic hosteling experience. In addition to meals inside The Source and AvantiF&B, two multi-merchant venues, I sat down to dinner at Ophelia’s Electric Soapbox, a popular restaurant and music venue in a former brothel, and visited the wizards at The Inventing Room dessert shop, where chef Ian Kleinman whipped up some crazy treats, including chocolate cinnamon nitro popcorn. Back at Denver International Airport, I made sure to arrive well ahead of my flight so I could enjoy a meal at Root Down,, in the center core of Concourse C.
The menu there is “field to fork” and the decor is very definitely fun and funky. Two South Dakota spots I recently visited – Deadwood and Wall Drug – face with the classic tourism challenge: how to get people to come visit. And then visit again. Since its Gold Rush-era founding in 1876, the South Dakota frontier town of Deadwood has been through several booms and busts. Yet it retains a veneer of the Wild West and keeps fresh the stories of legendary residents such as Calamity Jane and Wild Bill Hickok. But Deadwood is trying not to live up to its name: the town that helped spawn a popular cable series is looking for a shot of something new. “All destinations need to evolve over time, even those that that wish to remain the same,” said Alan Fyall, a professor in the Rosen College of Hospitality Management at the University of Central Florida in Orlando. Since November, 1989 — the year that Deadwood joined Las Vegas and Atlantic City as a cohort of then U.S. cities with legal non-reservation gaming — more than $18 billion has been wagered in the town. That activity has generated millions of dollars in tax proceeds to restore historic buildings in Deadwood, and to promote tourism statewide. But despite the addition of keno, craps and roulette this past summer, Deadwood is no longer confident of its winning hand. Recently, state data showed the city’s gaming revenues have plateaued, prompting some officials to suggest the town has to adapt to a more competitive landscape. On that score, Deadwood’s Revitalization Committee recently commissioned a 96-page action plan that contains recommendations on how the town can capitalize on its history and place in popular culture. Deadwood’s popularity is at least partly attributed to HBO’s three-season-long “Deadwood” TV series (which was canceled in 2006 but is still popular online) and attractions such as Kevin Costner’s memorabilia-filled Midnight Star casino and restaurant on Main Street. Brooks would like Deadwood’s Wild West-themed streets to be more authentic and pedestrian friendly. He’s also urged the town to create a central plaza where regular entertainment and activities can take place. Meanwhile, the town’s business community is grabbing the proverbial bull by the horns and rallying around those recommendations. “We developed 55 action items from the report, and have been busily working on making them happen,” said Mike Rodman, executive director of the Deadwood Gaming Association and a member of the Revitalization Committee. Currently, the town is building a new welcome center and in town more technology-friendly parking meters now accept credit cards and cell-phone payments. “We also cleaned up our signage, put up baskets of flowers on the street lights and wrapped some electrical boxes to make them less visible,” said Rodman. Next on the list: finishing plans for two downtown plazas and raising the $8.8 million needed to move that part of the plan forward, said Rodman. Deadwood may need to change, but Wall Drug credits its success to remaining pretty much the same. Now a block-long oasis of kitsch visited annually by more than a million visitors traveling along a lonely stretch of Interstate 90, Wall Drug got its start in the 1930s when the owners of a struggling drug store put up highway signs advertising free ice water. Thirsty Depression-era travelers pulled over for refreshments and purchased ice-cream and other small items while they were there. 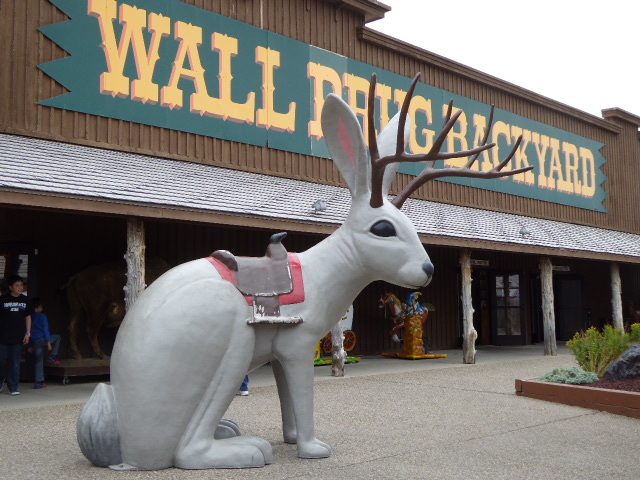 Over the years, Wall Drug evolved into one of the country’s most famous pit stop, with a cafe, restaurant, art gallery and shops that sell everything from postcards and T-shirts to jackalope hunting permits, turquoise jewelry and high-end cowboy boots and western wear. Dozens of free, photo-friendly attractions were built as well, including a giant jackalope, a replica of Mt. Rushmore, a shooting gallery arcade and a giant Tyrannosaurus rex that roars to life every 15 minutes. The ice water is still free, the coffee is just 5 cents and many grandparents make a point of reliving their childhood Wall Drug experience with their grandchildren. “My father and my grandparents wanted Wall Drug to be someplace where people could stop, have a nice meal and enjoy themselves without spending much money if they didn’t want to,” said Rick Hustead, current Wall Drug chairman and the oldest grandson of founders Dorothy and Ted Hustead. “Our guests spend on average two and a half hours here and 50 percent of our business is repeat customers, so we must be doing something right,” Hustead added. Here’s a look at the third video in a fun series promoting tourism in Wisconsin featuring cast members from the classic Airplane! film. Look for Kareem Abdul-Jabbar, Robert Hays and the inflatable Otto Autopilot. Missed the earlier videos? Here they are. North to Alaska? The rush is on. It’s not Klondike-era gold nuggets they’re after, but the gold that comes from mining tourism. Airlines, cruise companies and chains such as Cabela’s and the Hard Rock Cafe are heading north to Alaska hoping to cash in on a rising tide of visitors to the Land of the Midnight Sun. After three consecutive years of growth, Alaska’s visitor count reached an all-time high of nearly 2 million guests between May 1, 2013, and April 30, 2014, according to the Alaska Division of Economic Development. Those 1,961,700 visitors beat the 2007-20008 record by 5,000 people. Hard Rock now sees Anchorage as a “thriving, up-and-coming city that is uniquely positioned with a growing and flourishing cruise business” he said. He also noted that the local population was listed by the Census Bureau as having the nation’s second-highest median income in 2011. After a soft opening early this summer, the Hard Rock Cafe Anchorage will have a grand opening Sept. 19 at its downtown Anchorage location at Fourth Avenue and E Street, which is where the long-distance Iditarod sled dog race begins each year. Earlier this year, Cabela’s opened a 100,000-square-foot store in Anchorage selling hunting, fishing and outdoor gear with wildlife displays, an aquarium, indoor archery range, a mountain replica, deli, fudge shop and other tourist-friendly attractions on-site. Bass Pro Shops, with a wetlands nature center, stuffed animals, an aquarium and other tourist-friendly features, opened an outpost in July. The new tourism record for Alaska was boosted by increases in the number of cruise visitors, greater air service, growth in winter travel and an aggressive state-led tourism marketing campaign, said Joe Jacobson, director of the state’s Division of Economic Development. Close to a million visitors toured Alaska by cruise ship last year, lured by great scenery, not to mention a reduction in the state’s passenger head tax from $46 to $34.50. “After that, many ships returned to Alaska and new ships entered the market,” Jacobson said. Holland America added departures that brought 6 percent more guests in 2013 over 2012, Celebrity Cruises sent one of its new Solstice Class ships to Alaska for the first time and new ships entered the market, he said. Increased air service helped Alaska boost tourism numbers as well. Virgin America and Icelandair entered the market with service to Anchorage, and several other carriers (JetBlue, United and Delta,) increased the number of their Alaskan flights. One number that isn’t rising is the age of the average visitor. The most recent Visitor Statistics Program report that looked at demographics (2011-2012) found that the average age decreased slightly, from 51.6 to 50.7, between 2006 and 2011. Looking ahead, Alaska’s Division of Economic Development doesn’t do a formal tourism forecast. “But because changes in cruise ship deployment have a significant impact on the Alaska visitor market—51 percent of year-round visitors and 59 percent of the summer market—cruise industry schedules for Alaska provide a good indicator of what to expect,” said Caryl McConkie, the agency’s development specialist. Cruise Lines International Association Alaska estimated that the state will see 972,000 cruise visitors during 2014, compared with 999,600 during 2013, due in part to the redeployment of two Princess ships to Asia. Climate change might help the 2016 cruise season warm up as well. Since the 1990s, expedition-style cruise companies such as Polar Cruises, have offered sailings on smaller ships (with up to 199 passengers) that leave traditionally plied Alaska waters to explore Iceland, Greenland and sections of the Northwest Passage, which connects the Pacific and the Atlantic Oceans. In 2016, Crystal Cruises plans to be the first luxury line to navigate the Northwest Passage route. During a cruise from Aug. 16 to Sept. 17, 2016, the 68,000-ton Crystal Serenity, which carries 1,070 passengers, will travel from Anchorage/Seward to New York City, through Arctic waterways historically not navigable by large ships. Prices for the voyage start at $19,975 per person. (My story about tourism in Alaska first appeared on CNBC Road Warrior).